The first anniversary of the National Apology to the stolen generations and other Indigenous Australians passed with little fanfare last week. The muted recognition of the anniversary was undoubtedly partly due to the tragic bushfires in Victoria, which continue, understandably, to monopolise the country's attention and emotional energy. But the lack of major celebrations may also reflect the fact that the momentous event of February 2008 has not been followed up by significant developments in Indigenous affairs. Despite the widespread, though by no means unanimous, approval of the Labor Government's move to make the Apology its first Parliamentary action, no one would have expected that much measurable improvement would occur quickly. Although the Apology was important, its immediate effects were symbolic and psychological, rather than material. In her 2008–9 Budget Statement, Minister for Indigenous Affairs, Jenny Macklin, undertook to implement policies that would 'close the gap' between Indigenous and non-Indigenous in 'living standards, life expectancy and education, health and employment'. These gaps are chasms, Most people who know about the conditions prevailing among much of the Indigenous population understand that measurable results will take time. Many of those who feel Australia has an obligation to right wrongs, however, feel widespread impatience and disappointment. Some blame 'welfarism' and dependency, argue that the Government should adopt a tough love' solution, or locate in the private sector Indigenous Australians' best hope. Others argue that the complex and seemingly intractable problems that beset Indigenous Australians require acknowledgement of historical abuses, of continuing social exclusion and of systemic inequality. They also require a suite of responses, including ensuring that Australia's Indigenous citizens enjoy equal rights. Labor's continuation of many of the measures adopted by Howard's intervention is contentious. Vocal opponents in Alice Springs, Yuendumu, Katherine and the Top End are challenging the measures. Others adopt the 'stop whinging and get on with your life' position. They feel Aboriginal people should now stop expecting the state to do things for them. This view is reminiscent of calls by some people in the US for black Americans to acknowledge that, with the election of Obama, racism is dead. So they should take responsibility for their own conditions, despite glaring evidence of the enduring effects of their past subjugation and exclusion. In both cases, the success of a visible few is used as a stick to beat the many for their enduring disadvantage. Sometimes the successful join the detractors in vilifying their less fortunate kindred. Unquestionably many successful Indigenous people are to be found in academia, public service, business, the arts and the professions. Some share the frustration and impatience of other Australians who believe it's time for Aboriginal people to move on, to take responsibility for their destinies, to stop being victims. But success in a competitive environment is never attained single-handed. Even a cursory examination of the people our society deems successful shows that they had varying degrees of advantage. Perhaps the most potent form of advantage is to be born into successful families with the means, motivation and models to attain high goals. For many Indigenous Australians, these advantages do not exist. They must find alternative pathways to what society deems success. The health gap which government intends to close is emblematic of the size of the challenge. The health of the Indigenous population is woeful. To close that gap requires not only improved medical services, but that we find ways to undo inter-generational health problems such as the impact of poor nutrition on maternal health and on the vital organs, growth and development and immune systems. Another gap, which Minister Macklin does not mention, is the lack of knowledge, understanding and trust between Indigenous and non-Indigenous Australians. 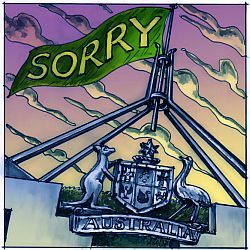 During the week of the anniversary of the National Apology, Reconciliation Australia released the results of a survey conducted in mid-2008. A large sample of Indigenous and non-indigenous Australians took part in the survey, which among other things examined the two groups' attitudes to each other. Despite many shared values, the survey found low levels of trust from each groups towards members of the other. This finding, after years of efforts by organisations like Reconciliation Australia, and by high profile individuals from each group, points to a need for much effort, on many fronts, for the foreseeable future. Let us hope that by the 10th anniversary there will be much to celebrate, with many significant milestones reached between now and then. Many thanks Myrna. Maybe we need one additional step. A culturally ingrained problem remains in that long enduring sense of worthlessness attributed in the past by white Australia on indigenous people and their cultures. Until we white mob are prepared to learn from their religious example, the people-land-spirit holistic integrity that Stanner and others have recognised, a huge cultural gap remains. When will we acknowledge we all have something to learn from indigenous cousins? Without that recognition, our sense of reconciliation remains always shallow. A national acknowledgment of Indigenous religious values,at least by Christian churches would provide a new link in the bridge building process. Maybe Eureka Street could help initiate this process! I hope we don't have to wait till the 10th anniversary for a reason to celebrate. Please keep speaking (so we can all hear you). Nevertheless I believe that you, and every other commentator I have read, miss one crucial structural point in this whole debate. At present no-one, neither black nor white, appears to have the faintest idea what a 'proper' indigenous future would actually look like. If we could wave a magic wand and instantly create the appropriate lifestyle for our indigenous citizensm, that is a workable mix (culturally, environmentally, economically, spiritually)of their ancient cultural traditions and our modern economic base, what would that lifestyle actually look like. Until we can imagine the future we can't possibly plan for it. And if we can't plan for the future, then sure as heck we can't achieve it. If it really wanted to take a leadership role in this area, then this is where Eureka Street should stsrt - helping everybody involved to develop a national consensus describing the desired indigenous future. Once we know what we want then, and only then, can we realistically start to achieve it. Well said Myrna! I cannot see much that is new in the intervention, compared with the exciting developments in the Pilbara where Aboriginal people now have access to supermarkets, fresh food and amenities that most of us city people take for granted. A colleague of mine who works in local government in Victoria was at an inter-council meeting today with indigenous leaders. She said that lack of acknowledgment of the apology anniversary wasn’t even mentioned. Their main concern at the moment is getting into the fire-affected areas to check significant sites. Creating an Indigenous future is up to Indigenous people, individuals and groups as they see fit, within the constraints of the real world. Non-Indigenous people can contribute best by keeping out of the way and not dog-whistling pathways that the people themselves may not have any intention of following. Absolutely right, Joe, that is one serious option. Leave them alone. Let us pull away altogether and no longer identity Aboriginal and Torres Strait Islanders as in any way different from the rest of us. We are all just Australians. Let’s abolish all federal and state ‘Departments of Indigenous Affairs’, let’s scrap the Northern Territory intervention and any other special programs, let them sink or swim in the current 21st century economic waters just like the rest of us. Sounds pretty radical to me but yes, definitely, it is one valid option for the indigenous future. So let us put it on the table, along with any other options, and open up the debate. For it is the debate that we must have. If we don’t have this debate, and through such discussion and dialogue together resolve the preferred futures option, then we are all surely and inevitably condemned to continue relentlessly down our present, totally disastrous, pathway. Dog whistles notwithstanding. My brother, who has been working with the SES, tells me of the eerie silence in the burnt-out bush: there are no birds. He also tells me of quirks of fate: some chooks had a miraculous escape, as did their owners, who later collected 40 eggs. The largely ignored United Nations World Day of Social Justice, and the task of the crumbling Federal Opposition, are not entirely unrelated. For both, holding governments accountable is the name of the game, or perhaps dream.